Taking Possession of Your New Condo…Building! If you’ve ever taken possession of a new home, you know that there’s lots to consider – from building inspections to mortgage approvals, the list is a mile long – and that’s just for handing off one solitary dwelling. Now, imagine all the work that goes into turning over not just a single unit,but an entire condo building! If you’re having heart palpitations just thinking about it, don’t worry, that’s completely normal. The process of transitioning ownership of a new building from condo development to the condo corporation is a complex one, full of legal considerations, in-depth inspections, lengthy documents, and LOTS of communication. The steps are intricate and numerous, which is why we brought in an expert –Brad Logel, Area Manager at Cardel Lifestyles (a division of Cardel Homes) – to walk us through the transition from developer to condo corporation. One of the first steps involved in taking over a new condo building is getting a handle on what makes that specific development tick. Every development is unique – as Logel puts it, they each have their own “storyline” that needs to be tapped into in order to guarantee success moving forward. These storylines evolve with the development and will shape what your building and condo corporation will become over the years and decades to come. When it comes to sussing out your own building’s storyline, it’s simply a matter of taking a look around and evaluating what your building will need to stay healthy and handsome. Does your condo’s storyline involve a lot of outdoor living and community spaces? You’ll need to make provisions for a landscaping budget. Do those big retaining walls provide a dramatic, modern look? Be sure you factor that maintenance in mind moving forward. Finally, does your new condo building face any potential challenges ahead, such as access points or elevation inclines? Take all these details into consideration – they’ll play a big part in your building’s storyline. 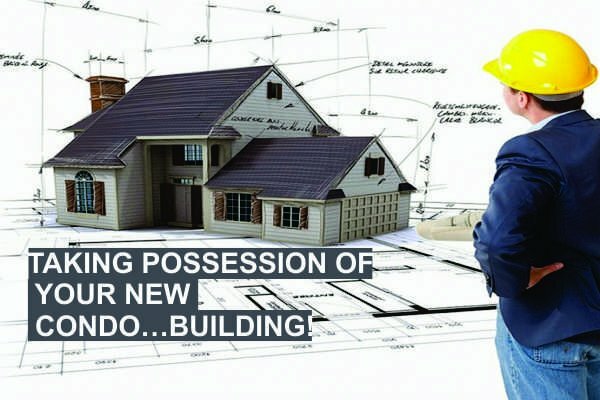 Before a single unit is released for sale – and oftentimes, even before construction begins – one of the first steps that should be taken between a building developer and the waiting-in-the-wings condo management company should be to come up with a budget to help determine what the condo fees will be once everything falls into place and is ready for the residents. This is a crucial step in the transitionary process, Logel informed us, because it sets the foundation (pardon the construction pun!) for what needs to be thought about regarding each aspect and area of the building. A condo with common outdoor spaces will require much different upkeep than one with a full-fledged playground. Likewise, a building with underground parkades, elevators, or other unique features will have their own specific maintenance needs. It’s critically important to have a clear understanding of these details moving forward because this vital information will help determine which costs are meant to fall to the condo corporation, and which ones are the responsibility of the owners. This, in turn, lays the groundwork for discussions around the condo’s financial future, reserve fund study considerations, and all those other details that accountants and lawyers love to chat about. Once all these particulars are sorted out and the construction workers have gone home (or at least moved on to the next phase of development), there’s nothing left to do but actually transition the building from the condo developer to the condo management company. Logel took us further through this process, which involves a walkthrough of the building, complete with an in-depth report detailing any wear-and-tear, deficiencies, and works-in-progress (complete with a timeline for…well, completion!). Once all these details are sorted, all that remains to be done is officially signing the building over! You didn’t think you were out of the woods quite that easily, did you? Once the building’s been physically turned over (which generally occurs on the first of the month after half of the units have been occupied, according to Logel), there’s still plenty of work left to do for everyone involved. Within a year, the first AGM will need to take place. Leading up to this event, it’s important to continue taking advantage of that open communication between the developer, the condo management company, and the residents, all in the name of plotting out a successful future for your building. Based on the storyline of your building and the surrounding area, the builder will need to inform the board and management company of their maintenance responsibilities. Budgets will need to be communicated in order to ensure a proper reserve fund study is set up and put into motion. The management company will need to converse with the board on a regular basis to ensure they’re being supported properly. Finally, all three parties will need to sit down to chat about the ongoing evolution of the building and what’s required to see it through as successfully as possible. When it comes to transitioning ownership of your condo building, good communication is an absolute must to ensure everything gets started off on the right foot and to guarantee a bright future for your new home. That said, it is without a doubt a complicated process, and one you’ll want to make sure you’ve got the best people involved in to make sure it all goes off without a hitch. We want to thank Brad Logel of Cardel Lifestyles for taking the time to walk us through this complex process! If you’ve got additional questions about the hand-off of your new condo building, don’t hesitate to reach out to us at Catalyst Condo Management!